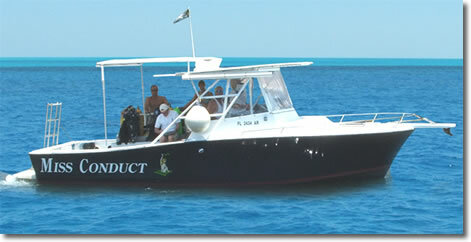 Miss Conduct is a 30' Custom Dive Vessel departing up to 3 times daily from Pompano Beach, Florida. We take a maximum of six SCUBA divers and a minimum of two, to all of the popular wrecks and reefs from Boca Raton to Ft. Lauderdale. In fact, since we leave out of Hillsboro Inlet, we can head either North or South to some of the best diving in South Florida. But we know some less visited spots too! Although we depart daily at 9:00 a.m. and 1:00 p.m, there is no fixed destination. Divers decide where we will go each day, based on their interests and experience levels. That means if you and your dive buddy want to do a wreck, you can do that without waiting for the scheduled wreck dive. If you want to do a shallower wreck, we can put you on several from about seventy feet or so. If you like deeper wrecks, we've got a bunch to choose from in the 110 to 130 foot range. For technical divers, there are choices ranging to 300 feet. 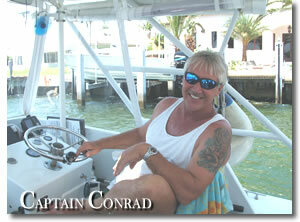 You will find Miss Conduct both less formal and more fun than the larger dive boats. The whole trip is more like going diving in your friend's boat....well, maybe not. You won't spend an hour going in circles above what you think is the reef but is actually a 3 foot rock in the middle of nowhere. You will drift the reef, conserving your air and letting the gentle South Florida current carry you along the reef line. When you come up, wherever you wind up, the Miss Conduct picks you up. While you kick back for a surface interval, I change over your tanks. If your dive profile suggests a one hour surface interval, take it. Diving is a relaxing sport, and we keep it that way aboard the new Miss Conduct. Come aboard and see for yourself this weekend. To toss you into adventure every week. Giant stride, back roll, or belly flopper...it's up to you. For a while you won't be thinking about your mortgage, your diet, or your list of stuff to do...and when you surface, you'll be looking at the beach from the other direction. Get in Touch and Book an Adventure Today! From Jupiter Inlet to South Miami Beach, there's no better scuba diving than right here in Broward County, leaving out of Hillsboro Inlet (next to Lighthouse Point). If you are looking to dive the wrecks and reefs of South Florida, Conrad Nix and Miss Conduct Charters can really show you some amazing sights. If you have never dived South Florida, and maybe you think the only good scuba diving is in the Florida Keys, give us a few hours, and you'll change your mind! Check out the new Miss Conduct ads as seen in Better Homes and Gardens, Nuns Life and on the Home Shopping Network! !